Today Dex and I are talking to some friends, Jamie and Beth. 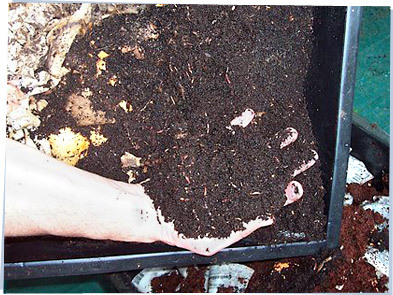 Besides making music and Web sites and things like that, they are vermiculturists, which means they use worms in a really interesting way: to cut down on the amount of garbage they throw out! And by the way — YUCK! Hey, Izz. Hey, Dex. Can you give us a hand? We're checking on our worms. See, these are our gardening worms. But the worms don't live in the garden. We have them in a worm "condo" — a special bin — in our kitchen. Yes! Finally, a real reason to keep worms in the house! I've always wanted a pet worm. We're trying to cut down on how much garbage we create. 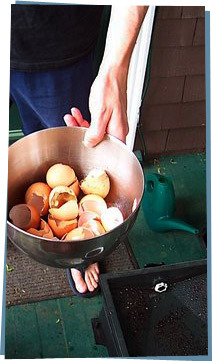 We feed kitchen scraps to the worms, and they turn them into nice, fluffy, full-of-nutrients "dirt." Okay. Still gross, but... this sounds green. So, where did you get the worms from? We bought them on eBay. There are lots of people who raise and sell worms for composting — and for fishing bait, too. We found ours for sale. We got 1,000 red wigglers, the kind that are good for composting. They weigh about a pound altogether, and cost about $20. 1,000 worms! In the mail? I don't like the sound of that. I also don't like the sound of anything called "wigglers." That's because they need names. Did you name them all? I could help. Aaron, Abner, Ace, Adam. Alan, Little Andy (he's so cute)... Wait. Was that Abner or Aaron? Hold on. I'll start again. They can chew up vegetables, dry leaves and grass cuttings, junk mail, newspaper, egg cartons, eggshells, leftover pasta, bread — even vacuum dust! It all turns into worm castings, which look like used coffee grounds, and smell like earth. Not so gross, maybe. So what have you learned, besides how easily you can gross me out? The first thing we noticed was how much organic, compostable trash we create. For just two people, we throw out about twice as much as 1,000 worms can eat. We may need to get more worms soon, just to keep up. We've also had to try to remember the life science and math we learned in school. You have to keep the right amount of moisture and air in the worm condo to keep the worms happy, and to get rid of any bad smells. It took us a while to get that balance just right. It's like a terrarium with a mission! I just hope you have a secure lid for that thing. Ick. We are sooo doing this!